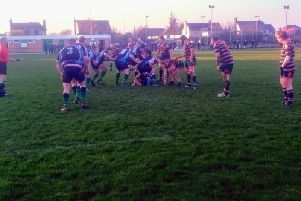 Fleetwood RUFC were beaten 27-7 when they travelled to Sefton at the weekend. They had gone there in expectation of another good display after an improved performance against Bolton a week earlier. It was not to be as, although Fleet kicked off with a strong wind at their backs, hard running by the Sefton forwards meant Fleet had to defend in their own half. A good break from Sefton put their left winger into the corner for an unconverted try and a 5-0 lead. Heavy rain then set in for the rest of the game as Sefton continued to dominate the forward exchanges but resolute Fleet defence kept them at bay until the 30th minute. That was when a catch and drive by the Sefton forwards from a five-metre lineout saw another unconverted try scored. Trailing 10-0, Fleet were sparked into action as a series of drives near the Sefton line resulted in a yellow card for one of the Sefton forwards for a high tackle. Using their numerical advantage, Fleet put Karl Bowling into space to score under the posts with Jamie Mayall converting to make it 10-7 at half-time. The second half saw Fleet continue to press the home side but a further score proved elusive. Ten minutes into the half and Sefton struck again when, from a five-metre scrum, they pushed over for a converted try and a 17-7 lead. A soft penalty for offside allowed Sefton to build a commanding 20-7 advantage before, with about eight minutes of the game left, a second converted pushover try gave them a deserved try bonus point and a 27-7 victory. Fleet’s forwards struggled in the scrum and lineout phases of play and were turned over far too easily when carrying the ball into contact. Joe Kirton put in a good display at scrum-half but Sefton supporters’ unanimous choice for Fleet’s man of the match was Mike Kelly, who was a tower of strength in attack and defence.